I said a few days back that I'd make an attempt to do less sketches with rocks and foliage... but apparently I was totally lying. Loki, the god of mischief, made me do it. I think it's time to do one with just rocks and foliage. Ooooo, now that's just nasty. 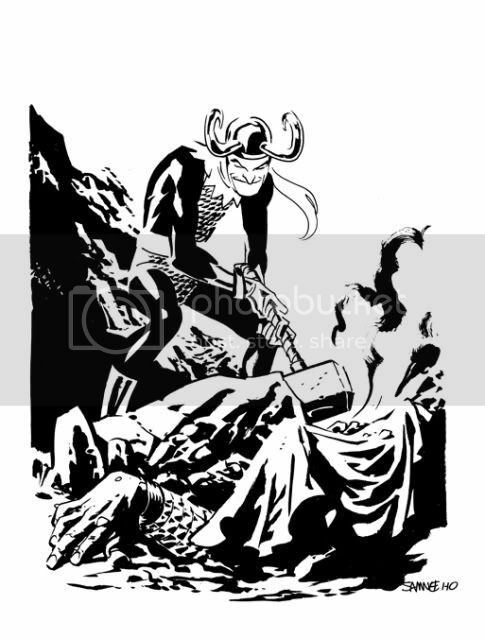 Loki looks so malevolently impish in this harrowing depiction that I can almost feel his hatred of Thor emanating off of him. I sure hope that Loki makes an appearance in Siege: Embedded so that I can see more of your take on the mischievous one. Momar's comment cracks me up...good call, though! Love the pose, the spotting of the blacks, and most of all the expression on Loki's face. I love the expression on Loki's face and another great job on the setting.